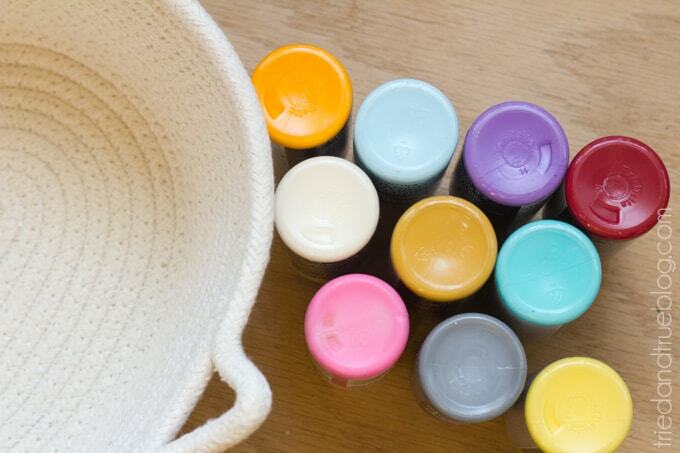 Home / Crafts / Budget / Kilim-Inspired Painted Basket in Three Easy Steps! 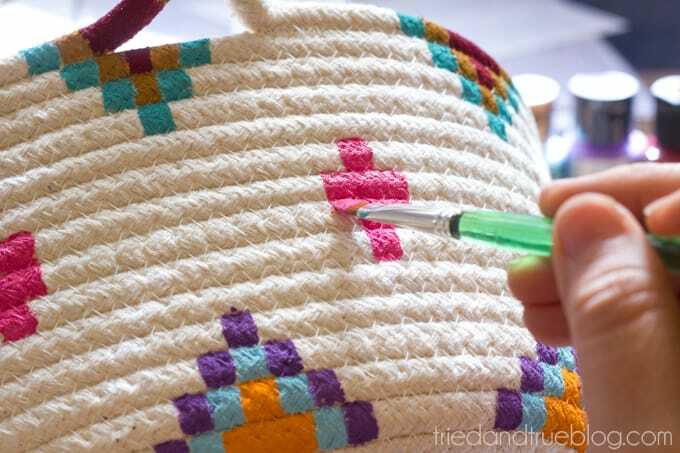 Kilim-Inspired Painted Basket in Three Easy Steps! 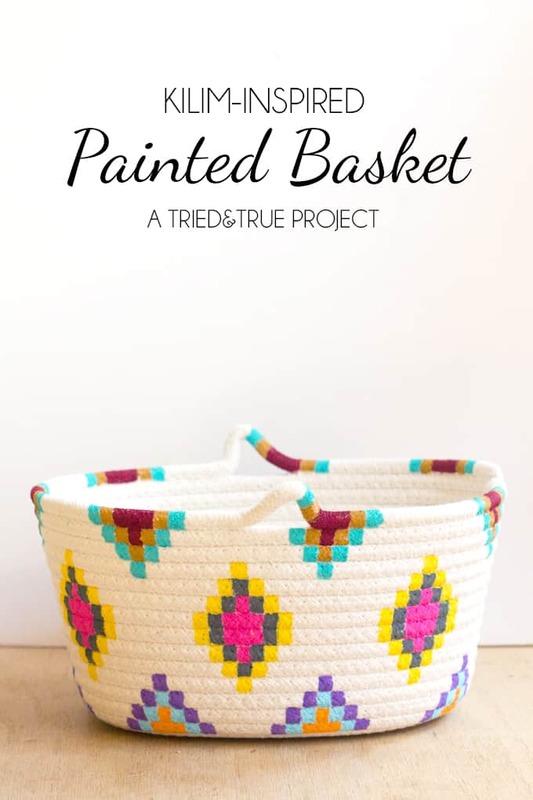 This Kilim-Inspired painted basket tutorial is an easy way to try out a fun new color palette quickly and inexpensively. 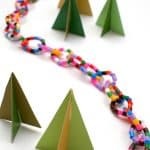 It’s so simple to make! I’m a huge fan of all the gorgeous Turkish Kilim tapestries that are showing up everywhere lately. 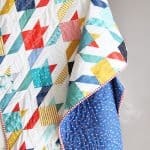 I love the wide variety of colors that are used in an unpredictable pattern. So unlike the monochromatic style I usually stick with! 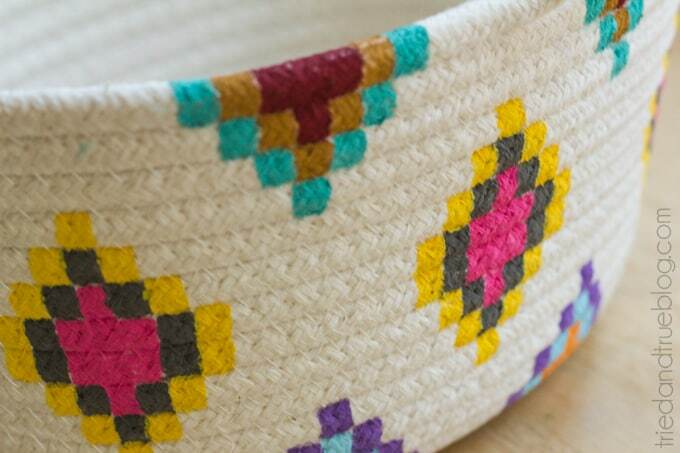 This Kilim-Inspired Painted Basket tutorial is an easy way to try out a fun new color palette quickly and inexpensively. Step One. Gather your supplies. I found this small woven basket in the dollar section of Target and selected these colors after looking through a ton of Kilim tapestries on a Google search. I would never have thought to pair these colors together but love how they look! Step Two. Begin painting your pattern. 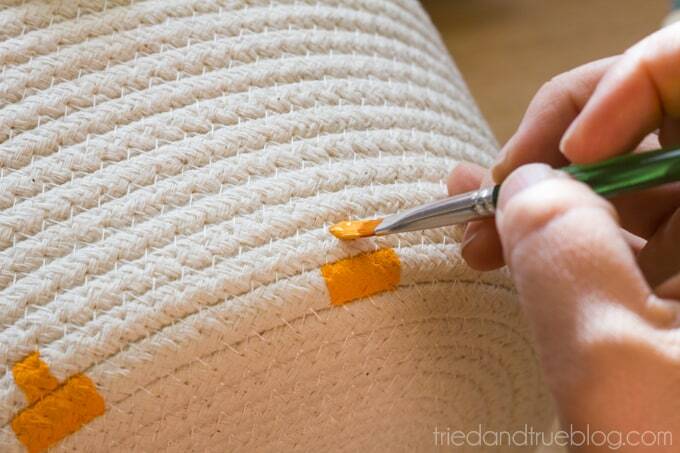 I used my paintbrush and the basket weaving as makeshift rulers. It’s ok if the design isn’t absolutely perfect. We’re going for a handmade look here! Step Three. Continue painting the design until you’re happy with the layout. I painted just a few diamond shapes around the entire perimeter of the basket and left a good amount of white space but feel free to do something more intricate and complex! Here is the finish look of the basket! I love how all the different shades of colors look together. The possibilities for customizing this basket to match your home decor or preferences is endless! I’d love to see this done with a larger basket or maybe a few small ones grouped together as a collection. Enjoy! 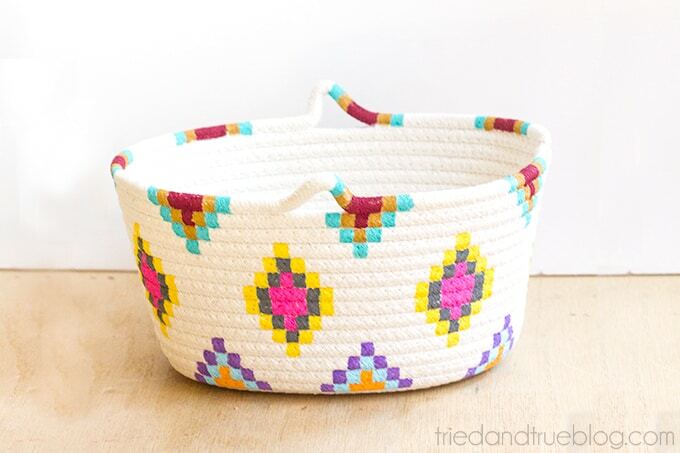 Hope you found this Kilim-Inspired Painted Basket useful! For another craft idea that’s just as simple, learn how to make canvas wall art with glue. Stop by Tried & True to check out some of my other DIY projects, including Chalkboard Spring Planters, Peep Spring Wreath, and my personal favorite, the World Map Wall Panels! Vanessa Brady is the mother of two small boys and a lifelong craft junkie. 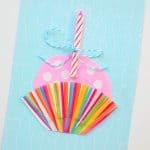 Vanessa’s craft tutorials can be found at numerous blogs, publications, and her mother’s brag book. 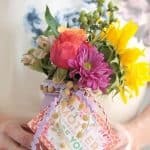 Visit Tried & True for more original projects and free printables! I can’t believe you found the basket in the dollar section at Target!! Wow I need to tell my Target to get better items in theirs!! I really love what you did and can’t wait to get my hands on a basket so I can try this!! That’s so cool! Thanks for sharing this idea. I will keep it in my mind. I love this basket, but I’m having the hardest time finding a woven basket like yours! Is it a cotton fabric? Or what is it made of? Thanks!